During the fall of 2014, Police Officer Austin Glickman came up with the idea of Law Enforcement Officers Weekend (LEO Weekend) while he was a police recruit in the New York City Police Academy. At the time, the first of many "racially profiled" incidents occurred throughout the country with the police-involved deaths of Eric Gardner and Michael Brown. Although these incidents were completely justified, they sparked a biased and deadly movement against law enforcement officers which continues to last to this day. As each week passed, media outlets specifically highlighted new police-involved incidents which added fuel to the fire, growing the hatred against law enforcement to an all-time high. Over the next 3 years, elected officials in our local, state and federal government turned a blind eye to the issue, allowing a small group of the general public to take hold of the media and spread their lies and hatred. Shootings and attacks against law enforcement officers spiked, with 135 officers being killed in the line of duty in 2016, 64 of which were shot to death. - Can you imagine going to work everyday, knowing that the media and the government are against you, physical and psychological attacks were at peaked levels, and that no matter what you do during the performance of your duty, you'd be judged in a negative capacity? The stress that this put on every member of law enforcement was astonishing. The jobs of a law enforcement officers are already hard and stressful, now couple those stress levels with this ongoing "movement" and you have a recipe for disaster. Stress plays a major factor in our mental and physical health. Law enforcement officers need to take time away from work to enjoy themselves, their family and their friends. With that in mind, Austin developed the idea to create a 3 day event, in which active and retired officers, their friends and their family members could come together from across the country and Canada, and be able to enjoy one of the most beautiful, relaxing places on earth, Lake George, New York. - A three day event which would allow attendees to relax, unwind, compete in friendly competitions, educate themselves in law enforcement related seminars, partake in nightlife activities, pay their respects to fallen officers and above all, have fun in a family friendly, outdoor environment. Law Enforcement Officers Weekend is open to ALL law enforcement officers (both active & retired), including (but not limited to): Police Officers, Corrections, Sheriff, Sheriff Deputy, Court Officers, Probation, Parole, Federal Agents / Federal Law Enforcement, District Attorneys, Public Safety and all others that support the Thin Blue Line. After approaching the Mayor of Lake George, Robert (Bob) Blais, New York State Corrections Officer John (Dave) Linehan, as well as a handful of other elected government officials, local business owners, the Lake George Chamber of Commerce and all of the surrounding law enforcement agencies, Austin's dream of creating such an event became a reality. Law Enforcement Officers Weekend was born. With amazing support from our committee and community partners, LEO Weekend was able to secure needed funding to not only get this event off the ground, but to also start a charitable, not-for-profit, 501c3 organization (pending). Our mission is simple: To provide a fun, relaxing environment for all attendees to enjoy, as well as providing the families of fallen officers, or officers whom were seriously injured in the line of duty, the ability to come to Lake George on an all-expenses paid vacation to our annual Law Enforcement Officers Weekend. We strive to raise as much money as possible to bring as many families as possible to Lake George and experience the true power and beautiful, caring nature of the biggest family in the world, the Thin Blue Line. Thank you for taking the time to read our story and we truly appreciate your support in making our mission become reality! We hope to see you all in Lake George on May 19th! 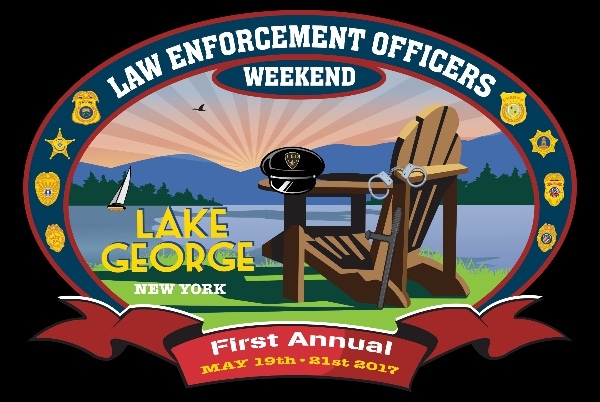 Only 5 days left until we kick off our inaugural Law Enforcement Officers Weekend in Lake George, New York! We are continuing to raise money to help bring families of fallen law enforcement officers to LEO Weekend! So far we've raised $1,145.00 by 21 people in 2 months. How much more can we raise in 5 days? Donate TODAY! We've raised $400.00 so far! Let's keep it going! Donate TODAY to Law Enforcement Officers Weekend and help us bring deserving families of the Thin Blue Line to Lake George, New York! The GoFundMe account for Law Enforcement Officers Weekend has been viewed thousands of times with 28 shares on Facebook, yet only 2 donations totaling $45. We can do much better than that folks. Help us bring deserving families of fallen officers and officers seriously injured in the line of duty to Lake George, New York! - Pleas share this post and help spread our mission! Register Now for LEO Weekend! In memory of my brother-in-law Jim Molloy. Thank you for planning this great event. In memory of Chief James Molloy. He will always be in our hearts and remembered for the hero he was on the NYPD and the husband, father, friend he was. In memory of our courageous and beloved brother-in-law, NYPD Deputy Chief James Molloy. Happy to help! Hope you all have a great time!